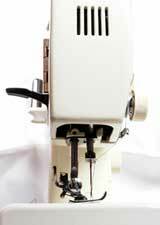 Great Used Sewing Machines - Where Can You Find Them? Since used machines cost less than newer ones with the same qualities, you are getting a great deal and saving money over what a similar machine would cost you to buy new. Where Should You NOT Buy Used Sewing Machines? Although it might be the cheapest alternative initially, picking up a sewing machine at a garage sale, auction or antique shop has risks. You won't know if it is in good working order until you get it home and try it out. You may find that parts are missing or broken. Finding and replacing any necessary parts may be difficult. Unless you are the type that likes to tinker, you may have to pay yet more money to get the machine serviced. Try to find a machine from a company that is still in business and you are more likely to have success with servicing and finding parts. If the owner’s manual is missing, check with the manufacturer - they will often be able to provide you with a replacement. Buying a used machine from a newspaper advertisement or even from someone you might not know very well could be risky. Be careful not to buy a machine and end up with somebody else's problems. There's no guarantee with this type of sale once your money has changed hands. Your best option is to buy a used machine from your local sewing machine repair shop as they often accept trade-ins of older machines on purchases of new machines. Those trade-in machines are then serviced and resold with a warranty - don't forget to ask about the warranty. This is the most reliable way of knowing your machine will be in great working order when you buy it. You'll also have the chance to test it out before buying. The dealer will even show you how to operate and adjust your used sewing machine and go over its functions and stitches with you. This is my old machine I bought around 1990. I use my industrial machines most of the time for my drapery business. 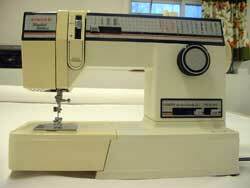 However, from time to time I do pull this older machine out for button holes or a stitch my industrial can't do. Although this is a basic machine by today's standards, it meets all my needs just fine. Let the dealer know what type of sewing you plan to use your machine for so they can help you pick the best machine for your needs. Take along some sample fabric scraps and make sure you have the chance to sew on the machine yourself (rather than just watch the salesperson sew with it).